About 2 percent of cattle are supershedders of E. coli O157:H7 bacteria. Just one supershedder in a pen can spread the bacteria to the hides of most of the other animals in the pen. Photo courtesy Agriculture Research Service. On average, about 2 percent of the cattle grazing in a pasture, or eating high-energy rations in a feedlot pen, may be "supershedders" who shed high levels of pathogenic organisms such as Escherichia coli O157:H7 in their manure, according to research led by U.S. Department of Agriculture (USDA) scientist Terrance M. Arthur. Supershedding is of concern because it could increase the amount of E. coli O157:H7 that makes its way from pasture or feedlot pen into packinghouses where steaks, roasts, ground round or other beef products are prepared. Often referred to as O157, this bacterium is apparently harmless to cattle, but can cause vomiting, severe stomach cramps, diarrhea or other illness in humans. 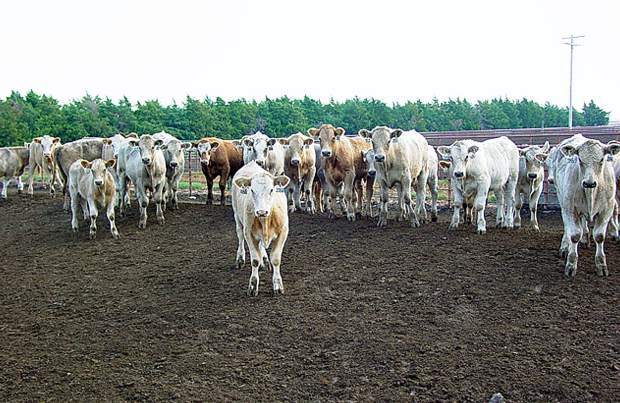 Findings from studies by Arthur and his colleagues at the USDA Agricultural Research Service (ARS) Roman L. Hruska U.S. Meat Animal Research Center in Clay Center, Nebraska, may provide a scientifically sound basis for new and effective strategies to curb shedding of this bacterium. ARS is USDA's chief intramural scientific research agency. Arthur and his co-workers have designed and conducted studies of 6,000 head of feedlot cattle and more than 13,000 manure, hide and carcass samples. The team was the first to show that, in supershedders, O157 colonization may occur not just in the lower digestive tract, but also throughout the supershedders' entire digestive system. Packinghouse managers can take that information into account when evaluating their facility's sanitation procedures. The researchers were also the first to determine that supershedding was not restricted to any particular O157 strain. Their work rules out the idea that tactics designed to reduce supershedding should target a specific strain or strains. Research by Arthur's group has also indicated that, in order for a cattle-management strategy to be deemed successful for reducing transmission of O157, no more than 20 percent of the cattle targeted by the intervention would be shedding the microbe at any one time, and none would be shedding it at supershedder quantities. Arthur and his coinvestigators, including ARS scientists Joseph M. Bosilevac, James L. Bono, Dayna M. Brichta-Harhay, Norasak Kalchayanand, John W. Schmidt, Steven D. Shackelford and Tommy L. Wheeler, all at Clay Center, have documented these and related findings in peer-reviewed scientific articles published in 2014, 2013, and 2009 in Applied and Environmental Microbiology. ARS and the Beef Checkoff program funded the research. These studies support the USDA priority of improving food safety.